French authorities arrest four members of a family in connection with a plot to carry out an attack. 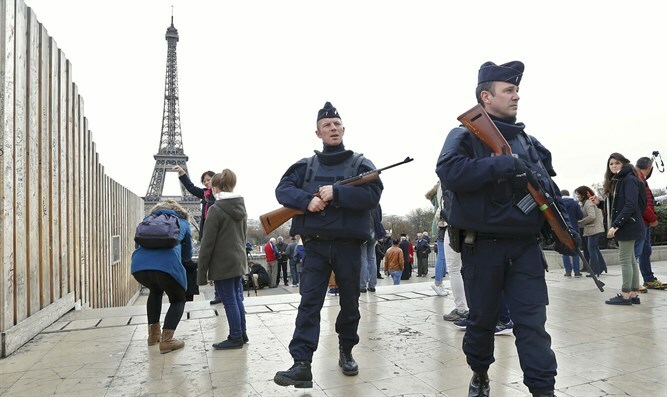 French authorities on Wednesday arrested four members of a family as part of a preliminary investigation in connection with a plot to carry out an attack, a judicial source said, according to Reuters. The four were arrested in the Clichy-sous-Bois suburb, east of the capital Paris. Bomb-making materials, including acetone and sulphuric acid, which can be used to make explosives, were found in a building in the neighborhood in January, according to Reuters. DNA traces from the objects led police to the suspects, the source said. France has been rocked by a wave of deadly jihadist attacks which began on January 2015, and remains on high alert. Last week, French police arrested three men suspected of planning a terror attack in raids in the Paris area, Marseille and the central city of Clermont-Ferrand. In February, French police nabbed four members of an alleged terror cell believed to have been planning a suicide bombing in Paris. The arrests included a 16-year old girl in Montpellier, who was arrested by a special anti-terror unit. At the beginning of February, a 29-year-old Egyptian armed with machetes attacked four soldiers on patrol outside the Louvre museum, crying “Allahu Akbar”.